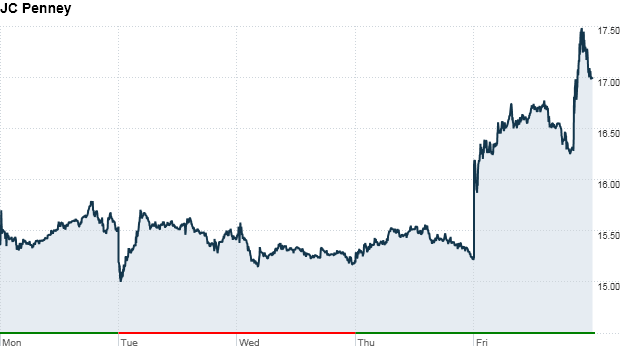 J.C. Penney shares rally after Goldman Sachs tosses the retailer a life line. Wall Street has been taking a second look at J.C. Penney in the weeks since controversial CEO Ron Johnson stepped down. J.C. Penney said Monday that it secured a $1.75 billion loan from Goldman Sachs (GS). The announcement confirms reports late last week that that the retailer was nearing a financing deal with Goldman. Shares of J.C. Penney (JCP) rose more than 4% Monday. The stock gained 9% last week as investors welcomed news that hedge fund mogul George Soros had taken a stake in J.C. Penney. Investors were also encouraged Monday by a report in the New York Post that two major hedge funds had invested in J.C. Penney. The loan from Goldman comes weeks after J.C. Penney announced that Johnson was stepping down as chief executive after just a year and a half. Johnson, a former Apple (AAPL) executive, had embarked on an ambitious turnaround plan for J.C. Penney by transforming the department store chain into a collection of boutiques. He ditched older brands and announced plans to eliminate checkout counters in favor of mobile and self-checkout. The results were dismal. J.C. Penney has been suffering steep losses, bleeding $427 million in the fourth quarter as sales fell 28% versus a year prior. Johnson was replaced by his predecessor, Mike Ullman, who ran J.C. Penney for seven years prior to Johnson's arrival. The loan from Goldman is an important part of the company's plan to strengthen its financial position, said J.C. Penney CFO Ken Hannah. "This will give us the financial strength we need to meet our current funding requirements and build toward a successful future," Hannah said in a statement. The five-year loan agreement with Goldman is in addition to the $850 million that J.C. Penney drew from its own $1.85 billion revolving credit facility earlier this month. J.C. Penney said the money will be used as to meet ongoing capital needs and pay down debt. 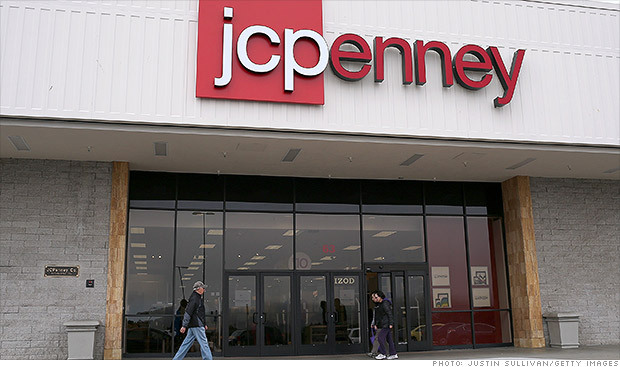 Despite the recent rally, shares of J.C. Penney remain down 12% so far this year. On StockTwits, some investors voiced concern about the company's long-term strategy as consumers continue to favor online retailers. Others were more optimistic, calling for further gains in J.C. Penney stock. Meanwhile, the leadership change at J.C. Penney raises questions about the investment strategy of Bill Ackman, the hedge fund manager who had backed Johnson's turnaround plan. if the investment thesis for Ackman in $JCP was johnson was this retail magician then why is he still long? You know what they say. Timing is everything. J.C. Penney has few friends on Wall Street, but Thursday, the troubled retailer gained one more. BTIG analyst William Frohnhoefer issued a "buy" rating, making him one of the few analysts to recommend purchasing J.C. Penney's stock. Frohnhoefer also set a price target of $22 per share. That's more than 40% higher from where J.C. Penney's (JCP) stock is currently trading. Early Thursday, shares slid 1% to $15.53. Sears has been a hot stock this year. But are investors losing patience with the turnaround story after yet another quarter of losses and slumping sales? Sears (SHLD) is amazingly still one of the hottest stocks of 2012. Shares are up nearly 55% year-to-date. But the retailer's stock plunged more than 20% Friday after the Kmart owner reported another massive loss and a decline in sales. Maybe Ron Johnson should have stayed at Apple (AAPL). The J.C. Penney (JCP) CEO continues to struggle to get the retailer on the right track. Click the chart to track shares of J.C. Penney. On paper, it was a really tough quarter for J.C. Penney (JCP), but CEO Ron Johnson was successful in convincing investors that the company is moving in the right direction.